All aboard the Chad Valley Pirate Ship and Ball Pit! Sparking creativity and imagination, get ready to discover and take part in new adventures on the high seas. Very easy to inflate you can fill the pit with water or play balls. 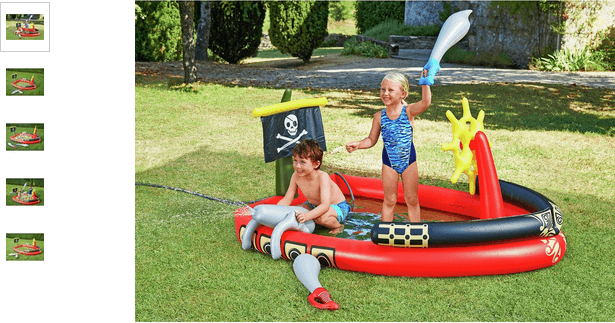 There is a super-sprayer water cannon that attaches to standard garden hoses so little ones can have amazing fun keeping rival pirates at bay. Plus Ship comes complete with two swords so little ones can playfully battle it out for the coveted treasure. When the little pirates are all tuckered out the easy to drain valve makes clear away a doddle. Get money off with April 2019 free Argos voucher codes, see if there's a discount code for the Chad Valley Pirate Ship and Ball Pit product. 4.1/5 from 23 recent reviews.